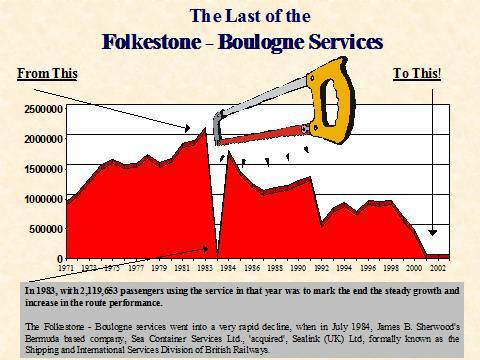 In 1983 before Sea Containers acquired Folkestone Harbour and the cross channel services, the port handled 2,119,658 passengers, and 102,981 accompanied vehicles and coaches.This Historic Maritime link between Folkestone & Boulogne is now broken. In Sealink privatization, formerly known as, Shipping and International Services Division of British Railways, Margaret Thatcher let James B Sherwood, the President of the Bermuda based company Sea Containers Ltd., obtain all the assets of Sealink UK Ltd in July 1984, this included over 37 Ships 10 harbours and 24 ferry routes for it was said £66million, even when there was two higher bids. (In the same year Sealink partners Zeeland Steamship Company had ordered a new ship on the Harwich–Hook of Holland route the M.V. Beatrix which cost in excess of £40 million). The common view was that James Sherwood just wanted to obtain Sealink just to asset strip the company but the Government disagreed. Michael Howard MP and Philip Carter, the former Mayor of Folkestone and council leader, claimed via the local paper on 10th August 1984, that they could reassure the readers about the future of Folkestone Harbour after their meeting with Sea Containers representatives. Mr Howard reported after the closure of one of the first route to go that "There were no plans to move the rest of the passenger traffic- foot, car and coach - away from Folkestone" Mr Carter added that regular meeting will be held and that "On the passenger side of the business, they wanted to expand the foot, car and coach traffic and to offer a better quality, more up-market service". If the town's Member of Parliament and Philip Carter did believe what they claimed is unsure, but what was sure was that James B Sherwood interest in Sealink was to profit by selling the assets. Sherwood announced in December 1989 his plans to turn the Port of Folkestone into a massive residential, retail, and leisure scheme he called the ‘harbour-village’. The ferry services where stopped, and the port closed and was left to fall into wrack and ruin, waiting for the property market pick up. Eventually, Sea Containers announced the sale of the Port of Folkestone, on a deal signed on 2nd July 2004, it was purchased by businessman Mr Roger de Haan, for $20 million (GBP 11 million). In August 2004 the Port of Folkestone’s cross-channel ferry facilities were removed. In March 2007, Shepway District Council agreed a ‘Change of Use’ from the Port of Folkestone being an International rail connected cross-channel ferry port, and to allow the land owner to make huge profit from turning the ports operational land so vital to the ferry operations, into seaside housing. Michael Howard has now stood down as Folkestone’s MP after 27 years. Sadly our new Member of Parliament Damian Collins, is not a champion to fight for the return of the Folkestone ferry services. nor will he stand against what the port owner is doing, or not doing, to the nineteenth century harbour built by Britain's famous engineer Thomas Telford. Roger de Haan’s pledged in January 2005, as the new owner of the Port of Folkestone, was to add two new berths for vessels of seven meter draught, to restart a harbour dredging programme to refurnish existing berths, and to create more cargo handling storage space and vehicle standage areas. In addition, to maintain the direct rail link to the harbour for classic passengers and to attract railfrieght cargo traffic to the Port. Regrettably, for the Town of Folkestone and for the ferry industry, none of these undertakings came to anything. Roger De Haan stated in the Folkestone Herald on 29th June 2006 that, “I have no interest in realising a profit from developing the harbour; I bought the land purely to secure a site for the university campus). As Roger De Haan has now got his university campus "University Centre Folkestone", which is now open, on the land that he first wanted. - So, in the best interests of the town of Folkestone, there was hope he will allow all the cross-channel ferry services to be restored, once he had put back all that which has been destroyed since he obtained the harbour on 2nd July 2004 and to profit from the cross channel ferry revenue that he would receive, as the sole owner of the Port of Folkestone? If you have a view, on what is wrong at the Port, share it Folkestone's new MP. Damain Collins. Click on name for link. What is the difference? 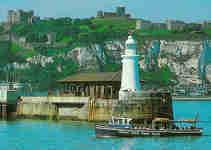 - A ‘passenger only’ craft, such as the one in use at Dover requires little or no port operational land. Seemly the only type of ferry the current port owner and the council's ‘Local Development Framework' will allow is a seasonal passenger only ferry such as Dover’s ‘Southern Queen’ might be allowed., Policy FTC4 of the Council's Local Plan should be changed to, 'safeguarding the restarting of ferry operations'. Click here to view Shepway's Local Plan on the Port of Folkestone. Shepway District Council’s Local Plan, “Policy FTC4, - supports safeguarding the potential to restart passenger ferries, new employment opportunities and the retention of Folkestone Harbour railway station”. By the end of 2012 as the Port owner had already demolished and removed all of the facilities at the harbour for the operation of cross-channel ferry services, regardless that it was against the Local Plan directive, seemly the council had turned a blind eye to the demolition. Roger de Haan's team got Shepway District Council to drop altogether 'Policy FTC4', and adopt instead their plans for seafront housing. Shepway District Council, without the need to consult the Public, have agreed with Roger de Hann and a new local plan has now been created, the ‘Local Development Framework’ for the Folkestone seafront makes claim that it supports of the work of Fosters and Partners in Roger De Haan’s ‘Masterplan’, - even when the council and the public have not seen the plans. Seemly as way of an inducement a money deal was done. Click here to find out about ‘The Port of Folkestone deal’. 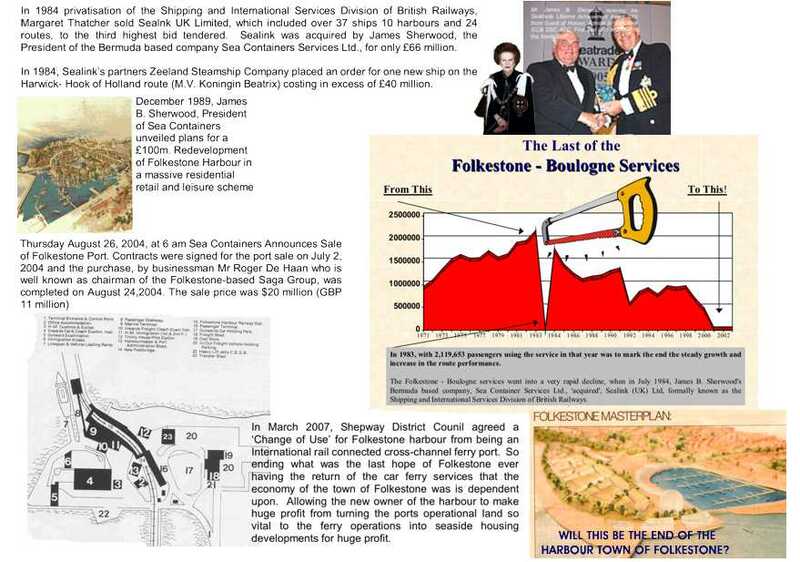 To view the 20 year plan of Roger de Haan and the architect of 'Boris Island' for the Port of Folkestone. - click here The plan shows that all of the port's operational land need for ferry services operation has been removed from Roger De Haan's plans.